Ganglia, OpenPBS, and cloning tools (Kickstart, SIS and G4U) are also covered. 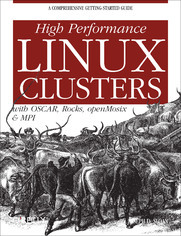 The book looks at cluster installation packages (OSCAR &amp; Rocks) and then considers the core packages individually for greater depth or for folks wishing to do a custom installation. Guidelines for debugging, profiling, performance tuning, and managing jobs from multiple users round out this immensely useful book. 2.2.1. What Is Your User Base? 2.2.2. How Heavily Will the Cluster Be Used? 2.2.3. What Kinds of Software Will You Run on the Cluster? 2.2.4. How Much Control Do You Need? 2.2.5. Will This Be a Dedicated or Shared Cluster? 2.2.6. What Resources Do You Have? 2.2.7. How Will Cluster Access Be Managed? 2.2.8. What Is the Extent of Your Cluster? 2.2.9. What Security Concerns Do You Have? 5.7. Is openMosix Right for You?